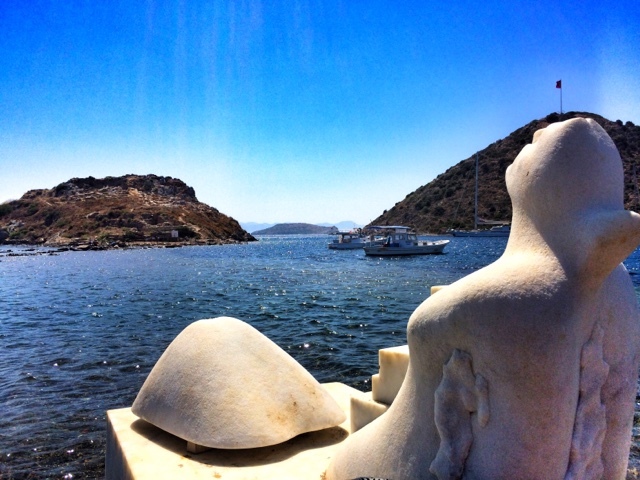 Zesty Moments: Gumusluk, the artsy Bodrum. 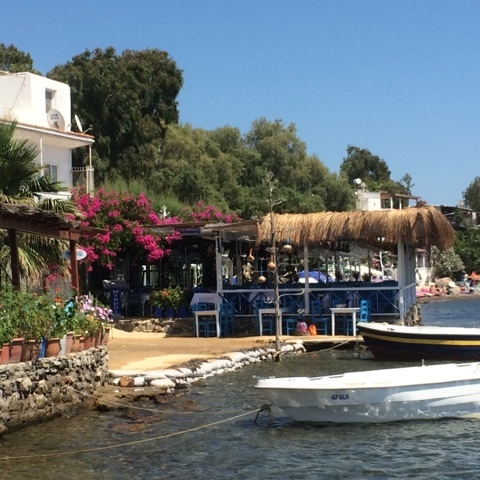 I have already written on this blog about how Gumusluk is my favorite out of Bodrum's many charming bays but I wanted to share a few thoughts from this year's outing as well. I find Gumusluk to be 'the place' for me because it has all I love rolled into one quaint place, art, color, Roman ruins and phenomenal sunsets. 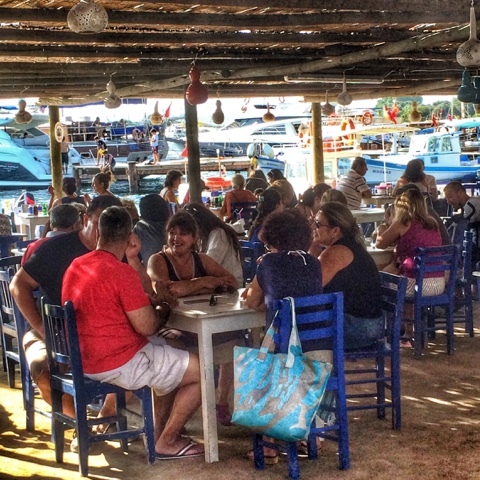 When Gümüşlük is mentioned, most people will start to talk about the many fish restaurants that line the shore. 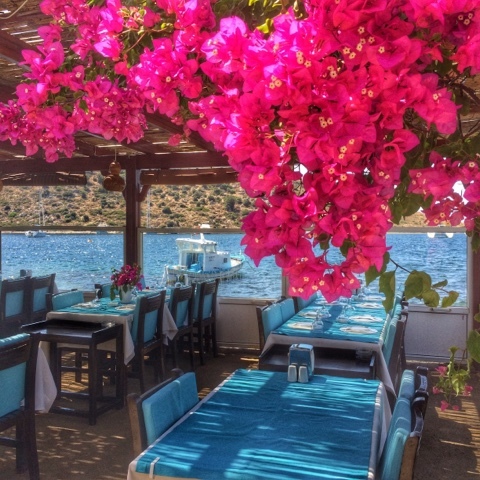 There are great places to go out to dinner, as there are in many places in Bodrum, but my experiences while visiting during the day have always been exceptional. There is a çay bahçesi (tea garden) that is at the very center of the little town. It is a non-pretentious establishment that serves sandwiches, drinks as well as lokma (fried dough balls drenched I syrup). The Çay Bahçesi is very reasonably priced with a great view of colorful boats and the town on one side and Tavşan Adası (Rabbit Island) where the remaining Roman ruins are still visible, on the other side. Gümüşlük was built on top of the ancient city of Myndos which is being excavated by archaeologists. It is possible to walk across the shallow sea and reach Tavşan Adası, by following the large marble slabs which a local fisherman referred to as the King's Way. Unfortunately, it is illegal to go on the island but reaching antique ruins by walking on water is still really cool. 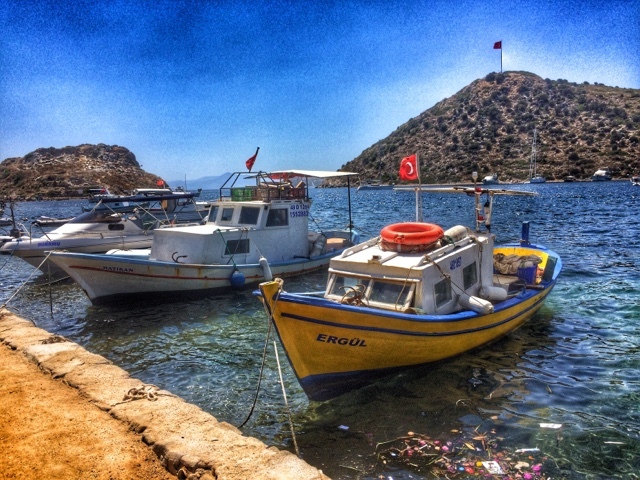 Art, nature and history are everywhere in Gümüşlük in perfect harmony. The very air seems to invite creativity. 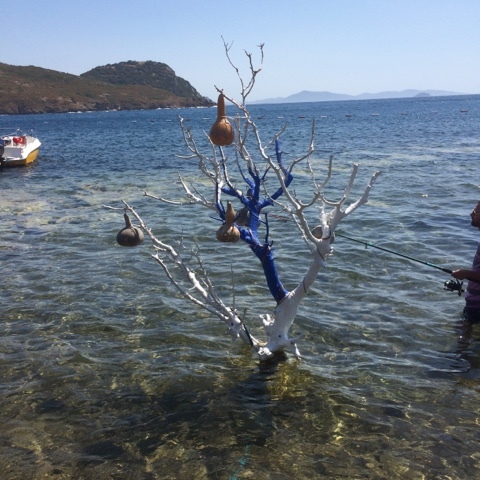 There are trees artfully decorated trees that grow in the middle of the sea, sculptures that interact with nature and the ancient ruins, as well as art studios, jazz bars, and music festivals. Just walking along the shore, one enters a magical world full of color and creativity. I especially love the decorated trees and the different colored straw umbrellas each establishment use to differentiate themselves from one another. 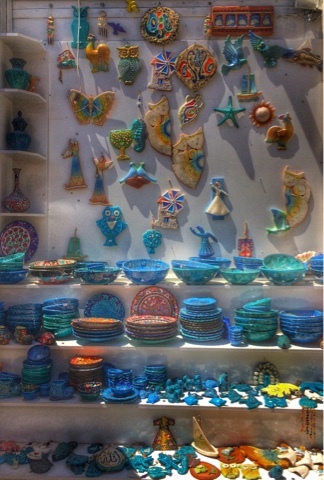 With its hand-picked vendors who are required to produce hand-made articles in-situ for their stands in the small çarsi (market), Gümüşlük is also a great place for shopping. I saw a guy who made silver jewelery similar to the coins excavated on site, a lady who made hand-painted cotton t-shirts and vests, all kinds of personal accessories as well as pretty decorative items for the home. 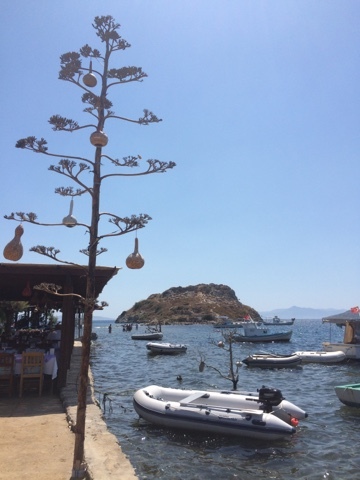 It is fun to just walk around, taking pictures and enjoying the view but when it get's too hot, the best thing to do is to take a dip in the cool waters of the Aegean. 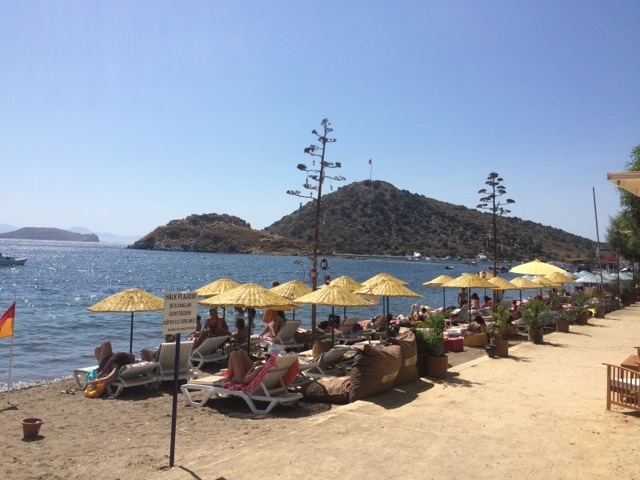 There is a public beach as well as bars, restaurants and clubs or small hotels along the shore with sunbeds and umbrellas. These places are good to grab a bite to eat or a drink and even free wi-fi. After walking around for a couple of hours, I stopped by Satsuma Beach Club to change into my bathing suit and just jump in the water. This place had the very clean showers and changing cabins and restrooms. After swimming, I sat at the restaurant and had some tea and sandwiches. You can charge your phone and use the wi-fi and go back to another dip, if you feel like it. 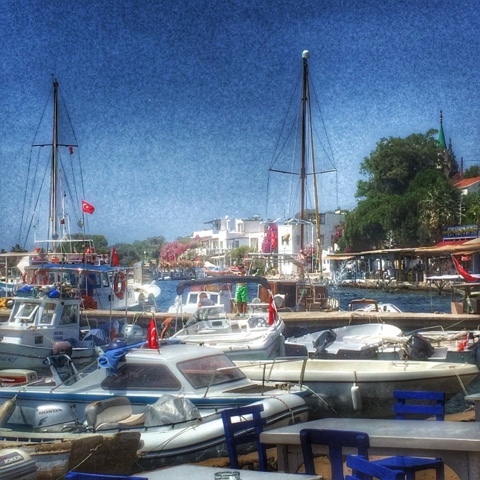 Just take a dolmus from Bodrum, Turgutreis or Yalikavak to Gumusluk or drive and park in the parking lot at the entrance of the town.